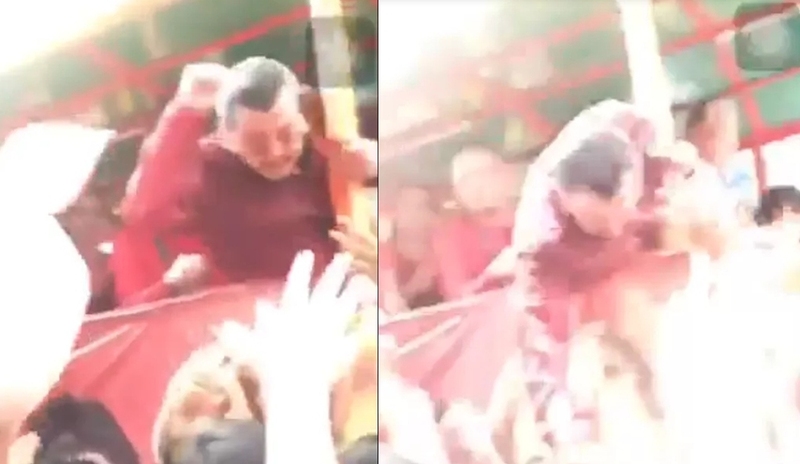 Former President and incumbent Mayor of the City of Manila, Mayor Joseph "Erap" Ejercito Estrada made headlines on social media as he was caught on camera allegedly punching one of his supporters during Motorcade Rally in celebration of the Chinese New year in Manila. In a video posted by a certain Mhalou Laderas, Mayor Erap Estrada showed wearing a Chinese attire while doing a motorcade but he was caught on camera punching one of his supporters. Despite being a Senior Citizen and already at his older age, Mayor Estrada seems to show some reflexes as some of his defenders on social media claimed the Mayor was just defending himself from an alleged robber. During the said incident, Mayor Estrada was seen shaking the hands of his followers but the uploader of the video captured an instance wherein the Mayor hit one of the people who tried to reach him. Based on the video, instead of reaching the hands of the Mayor, it seems that the man tried to steal the watch of Erap Estrada and that's the reasons why he raised his fists and tried to punch the alleged robber. The former President then pointed his fingers to the man and saying something, however, the noise of the crowd made what Mayor Estrada was saying. Although some netizens defended the gestures of Mayor Estrada, there are netizens also who warned for a possible negative impact of the video, some of Mayor Estrada's critic called out the Mayor for hitting someone during an event. Darling Sampol: -ano yun?bakit gusto manapak?hahaha!! !